Reuben Bauer states that prior to settlement in the Stony Plain area, many families first settled in Nebraska, Colorado, Washington, Oregon, and the Dakotas. They were lured to Stony Plain through letters from friends and family who told them that the government of the Northwest Territories under the jurisdiction of the federal government in Ottawa was inviting newcomers to homestead in the area. The letters were successful in bringing 240 men, women and children from Norka to the area between 1897 and 1934. 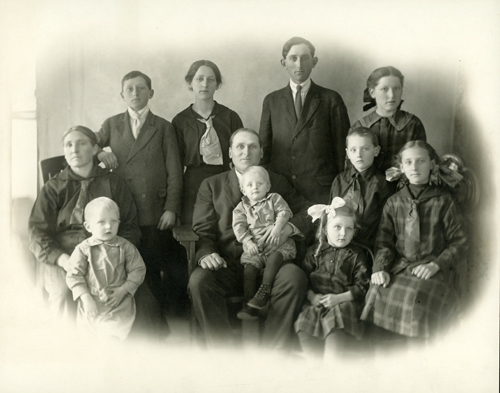 In 1897, the family of Ludwig Yost was the first to arrive. The families of Henry Schlitt, Adam Wolfe, and John Spady arrived in 1898. The first families to arrive directly from Norka were headed by Ludwig Webber, Gottlieb Feuerstein, Adam Giebelhaus, George Giebelhaus, Philip Schwindt Sr., George Scheidemann, Sr., Conrad Albrecht, and Peter Miller, who was unmarried at that time. The Elizabeth and Conrad Albrecht family on their way to church near Stony Plain around 1914. Back of the wagon: John; Middle of the wagon: Elizabeth holding Adam, Lizzie, Annie, Katie; Front seat of the wagon: Adam holding William, Henry and Emma. Photograph courtesy of Donna Palmer Wakefield and Debbie Pietrzykowski. The Albrecht family in Stony Plain. Photographs courtesy of Donna Palmer Wakefield. The book titled One of Many by Reuben Bauer lists the Conrad Albrecht family. Conrad was born in Norka on April 9, 1873 and was confirmed in the Reformed faith in 1888 by Rev. Staerkel. In February 1895, Conrad was married to Miss Elizabeth Derr who was born in Norka on August 25, 1877. Elizabeth was confirmed at age 15 by Rev. Staerkel. This couple with two children and Conrad's mother (Christina Marie Albrecht) emigrated from Russia in February 1900 and arrived in Stony Plain several weeks later. Upon arrival, the couple joined the Reformed Church (a log building at that time). In later years, they were active members of the Glory Hills Baptist Church. The children born to this family were: Henry (September 12, 1896), Katie (October 30, 1899), John (July 17, 1901), Elizabeth (March 22, 1903), Emma (June 3, 1906), William (May 10, 1911), Annie (June 14, 1913), Adam (April 9, 1914), Reuben (May 13, 1915), Lawrence (May 1917), Clarence (July 19, 1919), and Sarah (April 3, 1922). Reverend G. F. Vetter first served the community during the years 1898 to 1903. Rev. Veter was originally a clergyman in the German Reformed Church in the United States and later applied to move to the Edmonton Presbyterian Church in 1896. Rev. Vetter became interested in the Volga German settlers who had moved to Stony Plain because of their previous association with the Reformed Church in Russia. 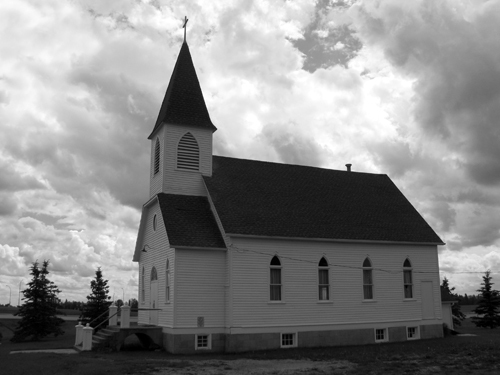 In the early days of settlement near Stony Plain, the congregation was known as a verein, a union known as a free reformed congregation without ties to any denomination. Rev. 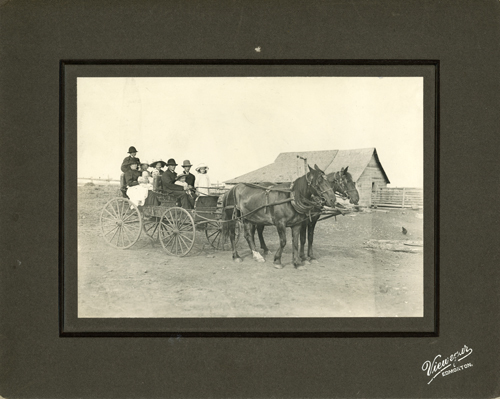 Vetter traveled to Stony Plain once a month by way of a wagon drawn by a team of horses. Worship services were first held in home of the settlers and later in the first Reformed Church log building that was constructed in 1900 on the farm of Adam Giebelhaus. Rev. Vetter often stayed overnight at the home of one of the parishioners. On the Sundays when the pastor could not be present, Elders Adam Giebelhaus and Louis Tippner shared the responsibility of conducting worship services by reading from the prepared sermons. In 1908, the congregation became a part of the Reformed Church under the leadership of Reverend Reinhold R. Birk. The church was named the Evangelisch Reformierte Hoffnungs Gemeinde zu Glory Hill (The Evangelical Reformed Hope Congregation of Glory Hills). The following members were present at the first congregational meeting: Adam Giebelhaus, Louis Tippner, Peter Miller, John Spady, Adam Wolfe, Ludwig Webber, George Scheidemann, and George Miller. Others who were absent but gave their consent to the reorganization were: Louis Yost, Louis Kniss, William Webber, Simon Witmer, and the widow, Mrs. Elizabeth Becker. At the first meeting, Adam Giebelhause donated an acre of land to be used as a cemetery and for the building of a larger church. It was noted that the congregation had 31 members and 38 children at it's founding. In 1910 planning for a new church began building. To reduce construction costs, lumber was donated from members who sawed timber on their farms. The building was 28 feet wide and 40 feet long with walls 12 feet high. The church was dedicated on September 15, 1912. The Hope Christian Reformed Church remains active to this date (2013) and includes members who are descendants of the original settlers from Norka. Prokop, Manfred. The Settlement of Immigrants of German Origin in Southern Alberta between the 1880s and 1910s: A Fact Book. Okotoks, AB: M. Prokop, 2013. Print. Town of Stony Plain. Web. 09 Aug. 2016. <http://www.stonyplain.com/>.